Mapa ng Imperyong Neo-Asiryo at paglawak nito. ↑ "National and Ethnic Identity in the Neo-Assyrian Empire and Assyrian Identity in Post-Empire Times" (PDF). Assyriology. Journal of Assyrian Academic Studies, Vol 18, N0. 2. 2004. http://www.jaas.org/edocs/v18n2/Parpola-identity_Article%20-Final.pdf. "The Neo-Assyrian Empire (934-609 BC) was a multi-ethnic state composed of many peoples and tribes of different origins." ↑ 5.0 5.1 "Assyria and Syria: Synonyms". PhD., Harvard University. Journal of Near Eastern Studies. 1992. http://www.youtube.com/watch?v=_KesgkBziUs. 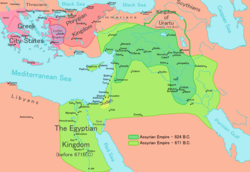 "And the ancient Assyrian empire, was the first real, empire in history. What do I mean, it had many different peoples included in the empire, all speaking Aramaic, and becoming what may be called, "Assyrian citizens." That was the first time in history, that we have this. For example, Elamite musicians, were brought to Nineveh, and they were 'made Assyrians' which means, that Assyria, was more than a small country, it was the empire, the whole Fertile Crescent." Huling pagbabago: 18:19, 3 Hulyo 2018.